Is Boris Johnson a joker or the next PM? 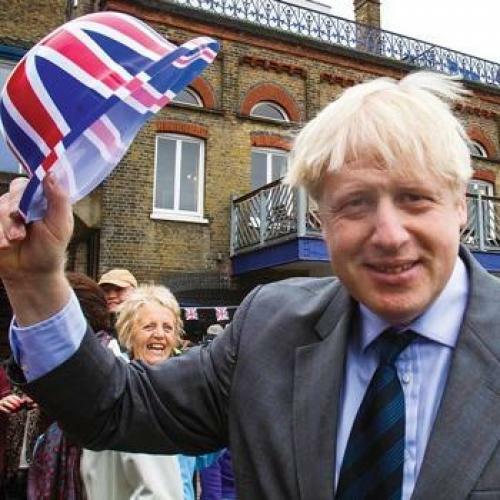 ASK WHO IS THE most charismatic Conservative in Britain right now, and the answer will come straight back: Alexander Boris de Pfeffel Johnson, once shadow minister for the arts, now mayor of London, columnist for The Daily Telegraph, comic turn-taker, and coquette. And soon to be leader of the Tory Party? Not according to him. But the more he tosses his canary yellow locks and declares he has less chance of becoming prime minister than of being “decapitated by a frisbee [or] blinded by a champagne cork”—neither all that improbable given his lifestyle—the more we are convinced he thinks of nothing else. And the worse things get for David Cameron’s premiership—his party languishing in the polls after bad local election results and a budget of monumental indiscretion, injustice, and indecisiveness; his judgment in the matter of friends and advisers called seriously into question; his demeanor turning increasingly grouchy and preoccupied (so preoccupied that he accidentally left his eight-year-old daughter in a pub)—the better Boris’s chances look. Not that either man will admit to a rivalry. We call Boris Johnson “Boris,” but we don’t call David Cameron “David.” That ostensibly small distinction, which you can bet your life does not feel small to the prime minister, conceals a world of difference. They are both Etonians, both graduates of Oxford, both onetime members of the Bullingdon Club—a secret dining and boozing society for the fatuously overprivileged, where the wearing of tails and the popping of champagne corks (if not the throwing of frisbees) is de rigueur—and therefore both, you would think, unlikely to strike a single chord of sympathy or solidarity with a British populace bleeding from a thousand cuts. Yet we refer to Boris as “Boris” and smile when we see him on television. It takes some explaining. We could start with One Man, Two Guvnors, the phenomenal success of which is to be attributed to the British genius for pantomime. An update of a farce by Carlo Goldoni, the play tells the story of a cash-strapped glutton serving more masters and answering more demands than you would think it possible to remember, let alone satisfy. Uncompromised by subtlety or seriousness, it is a whirlwind tour through everything the British find funny: mistaken identities and bedrooms, maniacal resourcefulness, the failings and flailings of the body, and, above all, a class system whose very anachronism is its comedic virtue. Boris Johnson mobilizes all these comic elements in the persona he presents to the public. His masterstroke is to consciously anachronize himself. He is amusing to look at, soft-mouthed, cherubic, a fallen angel uncomfortable in his clothes, tousled. “And how long have you been cutting your own hair?” David Letterman asked him recently, rather missing the joke, since those who know him insist he tousles himself with great deliberation before going on air. (One might pause for a moment to note that he appeared on Letterman’s “Late Show” at all.) Boris famously champions bicycles and as mayor has been responsible for a city-wide bicycle-sharing scheme, but he never looks entirely secure on his own; his rascally precariousness being of the sort he would like us to think defines his well-publicized role as extra-marital lover (the sort of man who keeps his socks on in bed) as well. He peppers his conversation with classical allusions in a way that manages to be both pedantic and a joke against pedantry, just as his lineage, as a scion of high-born families from every hegemonic corner of the globe, from Württemberg to the Ottoman Empire, at once justifies his pampered air and mocks it. While Muslims, Jews, and Christians jostle for genetic supremacy in him, the country it is easiest to identify him with is the imaginary kingdom of Ruritania. Thus, to his own amusement, he is prince of everywhere and nowhere. Such glorious dilettantism works best for him when he remembers that London is not, after all, the Bullingdon Club and that being mayor of London entails striking a patriotic note when the occasion calls for it. His speech in Beijing four years ago on taking custody of the Olympic Games was a bravura mix of buffoonery and flag waving. He reminded his hosts that, while they may excel at table tennis, it was the English who originally invented the game as a dining room diversion called “Whiff-Whaff.” “The French looked at a dining table and saw the opportunity to have dinner; we looked at a dining table and saw the opportunity to play Whiff-Whaff. ... Ping-Pong is coming home!” Was that nationalism or clowning? Grandiosity or bathos? Either way, though Boris’s familiarity with the best restaurants in Paris would never be in doubt, his gibe against the French (themselves unsuccessful bidders for the 2012 Olympics) warmed the cockles of every British heart. I have played him at Whiff-Whaff, as part of a publicity stunt to draw attention to another of his wheezes to brighten things up, this time the temporary erection of table tennis tables in parks and public spaces all over the capital. For someone who didn’t unbutton his jacket, he wasn’t too bad. We had met before that, on the same side of a debate, bewailing the emergence of “chavs,” a working-class grouping, unknown I think to Americans, distinguished by its addiction to celebrity in general, Posh Spice in particular, and bling jewelry above all else. Boris arrived late, apologizing and spilling papers, and delivered a lazily blustering speech, apparently from off the top of his head, laced with references to classical authors unknown to most chavs. Had he really not prepared or was his unpreparedness highly wrought, like his mop of untidy hair? Was the fraught oafishness designed to make him seem the cleverer or the more endearing? And why did I get the feeling that, because I was inessential to him, I might as well not have been there? To those who believe his buffoonery conceals the steeliest intent, the word for Boris is cynical. “A calculating careerist,” the distinguished commentator Nick Cohen called him. “A duplicitous scoundrel,” in the words of his former employer Conrad Black, a man who could be said to know a thing or two about duplicity and scoundrelism. But to call a man calculating or even duplicitous is not to negate the relief he might bring to a too earnest world. People searching for a precedent for Boris in literature go mistakenly to the aristocratic duffers of P.G. Wodehouse. His true forbear is to be found in Charles Dickens’s Little Dorrit in the person of Ferdinand Barnacle, the “best and brightest” of the Barnacle family, which runs the Circumlocution Office, that blight on Victorian England. Arthur Clennam, the hero of Little Dorrit, is idling and moping in debtor’s prison when Ferdinand Barnacle drops by to warn him against trying to make the world a better place and to accept that society is unimprovable. “We must have humbug, we all like humbug, we couldn’t get on without humbug.” For all his cynicism, or maybe because of it, this “engaging young Barnacle” lights up Clennam’s prison cell with what can only be called his robustness of being. There is strength in life beyond the exercise of high principle. Boris has twice now defeated Ken Livingstone, the previous mayor of London, a man of rigid ideology and therefore grinding prejudice. Boris’s success so far might well be explained by his believing in nothing. Where conviction kills, an amused and vivacious nihilism—or, more cynical still, the affectation of nihilism— will look attractive, no matter how self-serving. It could be enough to take Boris further still. Howard Jacobson is the author, most recently, of The Finkler Question. His upcoming novel, Zoo Time, will be published in the fall. This article appeared in the July 12, 2012 issue of the magazine.